Nafplion's streets pass bright flowers and look up at wooden balconies, with lively cafes encouraging a natural break during joyful wandering. Indeed, the town's charm and relaxed atmosphere more than make up for its lack of classical ruins. Fascinating mosques and churches add to the mood. The old part of town has some delightful shops, with items ranging from touristic kitsch to elevated art. Visitors will enjoy searching the area for souvenirs. Otherwise, Nafplion has several decent malls and grocery stores for self-caterers. Visitors can also try the town's markets for local crafts and produce. Visitors can expect to find traditional Greek dishes at establishments along the bustling harbour, or in the grand Venetian-style square called Plateia Syntagmatos. Other options include fast food and a variety of international cuisines. Nafplion has a vibrant nightlife. Some of its best establishments reside in the harbour area or perch dramatically on the cliffs. Also, the town's scene is fairly broad, meaning visitors can choose between partying and relaxing over sundowners or romantic meals. Visitors can enjoy art galleries and interesting museums dedicated to archaeology, folklore, Komboloi (worry beads), and even Ouzo. Otherwise, they can hike up to the Venetian Fortress of Palamidi and enjoy the view, or relax at beaches, waterfront tavernas and open-air cinemas. Nafplion is also a comfortable base from which to explore the Peloponnese' remarkable archaeological sites. 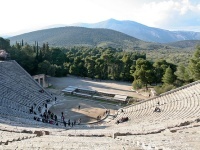 These include the ancient Greek theatre of Epidaurus, and Sparta's ruins. Athens is less than two hours' drive away. Although it has been described as a prettier, cleaner and quainter version of Athens, things can get fairly chaotic in Nafplion during the summer months, particularly as it's a very popular weekend excursion for the Athenians themselves.